to buy dairy, basic grains, oil and canned food. Wilfredo benötigt für dieses Geschäft noch 750 US-Dollar. » Schon mit 25 US-Dollar können Sie Wilfredo unterstützen! Geld wird für Wilfredo gesammelt. Wilfredo is a charismatic and hardworking man. He starts his work every day at five in the morning as a way to take advantage of the day in his grocery store. With good customer service and a variety of products at good prices, he has obtained the loyalty of many customers. His two children are who bring him the motivation that he needs day after day to be better. 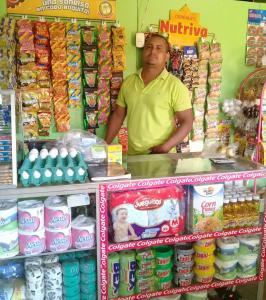 He has come to Kiva and MiCredito to request a loan that will allow him to build his business. He is going to buy dairy, basic grains, oil and canned food. In the future he hopes that his business turns into a large distributor.